In the last few weeks the Pirates have traded Bryan Morris to the Marlins and announced the player to be named in the Ike Davis deal. 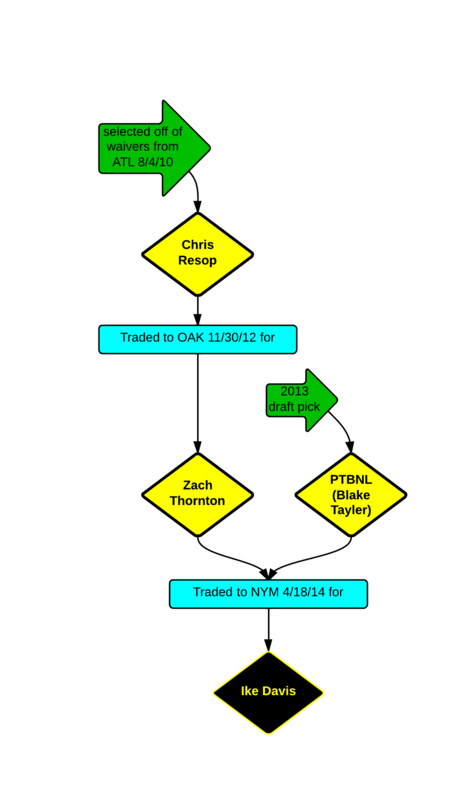 Let’s look at how the new information alters the trade trees for those players. Morris was known as the last player left from the Jason Bay trade. That honor now falls to recent draft pick Connor Joe. The speculation at the time of the Ike Davis trade was that the PTBNL was a 2013 draft pick, and by rule could not be traded until one year after the draft. This turned out to be true when last year’s second round pick Blake Taylor was sent to the Mets on June 15. I’ve started contributing a weekly fantasy baseball article to ROTOScouting.com. If you like what you read from myself or any of the other authors, please consider subscribing.